If you’re a fan of Hollywood’s golden age of comedy then you really must be a fan of Laurel and Hardy. Their comedy ranges from broad slapstick to subtle visual and sound gags. The pair made a massive number of films and shorts between 1926 and 1951, and Universal has brought many of them together for this collection. Universal's collection comprises a mammoth twenty volumes, which are available individually, or as a box set, which comes with an exclusive bonus disc of special features. The press release for the set, which includes a breakdown of the content of the twenty-one discs, can be found here. The feature films contained in the collection are presented in two versions: a restored black and white version, and a version with computer-generated colour. All of the shorts are present as restored black and white versions, and most of them have colour versions as well. These colour versions were created during the 1980s, during a fad for colourising black and white films and TV programmes in an effort for them to reach a larger audience. 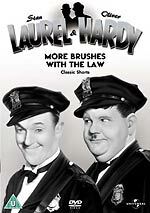 Some of these restored black and white w and colorized versions were issued previously by Vision Video (one of the Virgin group of companies), and a similar offering has been released elsewhere in Europe, but this is the first time that such an extensive collection has been put together on DVD in the UK. I had chance to take look a three discs from the collection – Volumes 3, 5 and 20. The first two volumes contain a main feature supported by two shorts. The latter is a collection of shorts. The films run for about an hour, and the shorts are around twenty minutes long. 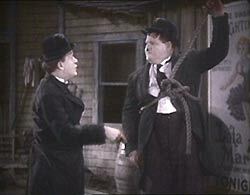 I’m quite a Laurel & Hardy fan, but not a massive one. I know many of their feature films and shorts through TV airings and the odd DVD purchase. These three discs contains plenty of films I'm familiar with, along with several I hadn’t seen. So, I was looking forward to seeing those I’d enjoyed before as well as discovering some new ones. The main feature on this disc is the wide regarded, Way Out West (1937). The film also stars Laurel and Hardy stalwart James Finlayson, who appear in many of their films and shorts, right back to the silent days. 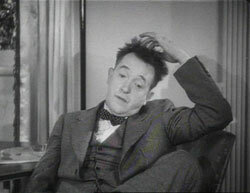 He also appears in the two shorts contained on the disc, One Good Turn (1931) and Thicker Than Water (1935). All three films are presented as restored black and white and colorized versions. In Way Out West the boys arrive in the wild west burg of Brushwood Gulch in search of Mary Roberts. They have the deed to a gold mine for her: an inheritance from her recently deceased father. They run into Mickey Finn (Finlayson) who owns the local saloon who presents his wife, dancing gal Lola, as Mary Roberts and the deed is handed over. When the duo discover the real Mary, who works as a maid in the saloon, they endeavour to get the deed into the right person's hands. 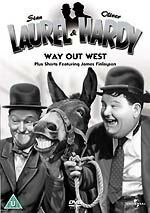 Way Out West is widely regarded as amongst Laurel and Hardy’s best work, if not the best work they did. This is a fantastic film, chock-full of wonderful moments, from the subtle (Stan doing a bit of business putting his boot on) to the set-piece (the sequence where the duo try to winch Ollie onto a balcony as they attempt to break into the saloon, which ends with a mule on the balcony!) The campfire scene is particularly glorious. It features a subtle transposition and homage to Chaplin's The Gold Rush, which contains a famous scene of an impoverished prospector who resorts to eating his shoes. 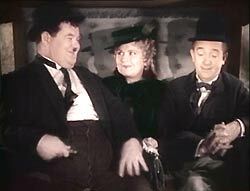 In Way Out West Stan has to eat Ollie’s bowler, to the orchestrated strains of Where Did You Get That Hat? The film is, however, perhaps best remembered for the contribution of bluegrass group The Avalon Boys. Stan and Ollie’s dance routine to the playing of Commence Your Dancin’ outside the saloon, and a little later inside, where there’s the shared singing of The Trail of the Lonesome Pine, are both a joy to behold. The latter was released as a single in the UK during 1975 and got to number two, only held off by a re-issue of Queen’s Bohemian Rhapsody. Without question this is a superb film, with the duo on top form. The black and white print is a good one, with only a small amount of dirt and sparkle. The soundtrack is also remarkably clear, with only minimal hiss. The colour version looks like it was done using a poorer print, without the benefit of the clean-up the restored black and white print has had. There are quite a few scratches evident, most notably during the Commence Your Dancin’ sequence. The colour version is also missing the MGM card at the beginning that is present on the black and white version, and suffers from the inclusion of two cards for the colorization company, at the end of the opening and closing titles. In One Good Turn the boys are "victims of the depression", travelling around America in a tent. An old lady offers to gives them some food in exchange for them chopping fire wood. The pair overhear the old lady arguing with a “mortgage lender” (Finlayson again) who threatens to take away her house if she fails to meet the repayments. So, the boys set out to help the old lady by raising the money for her. What they don’t know is that the “mortgage lender” is really the head of a local group of community actors, which the old lady is also a member of, and they were doing a spot of practising. This short is fairly routine, but entertaining enough. The highlight being when Stan finally snaps following a wrongful accusation from Ollie, and goes after him! The black and white source materials for this short are quite rough with lots of dirt and sparkle. The colorized version however is better, seemingly having gone through some clean-up work. It is, however, missing the opening of the titles – jumping straight into the support cast titles. 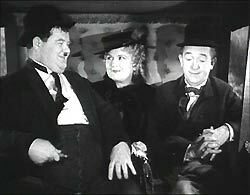 The final short of the disc, Thicker Than Water, sees Stan renting with Mr and Mrs Hardy, who convinces Ollie to pay off the money owed on his hire purchase furniture to shop owner Finlayson. They manage to lose the money, and Mrs Hardy hits Ollie with a frying pan, and he ends up in hospital. Whilst there he needs a blood transfusion from Stan. The transfusion goes wrong and, in the highlight of the piece, the two swap characteristics, voices, ties and moustache. It’s a sequence which allows the stars to flex their comic acting muscles. The Red Dwarf episode Bodyswap owes a huge debt to this short. Another highlight is the technical gag where the pair end some of the scenes by dragging the next scene from one edge of the screen across to the other. Genius. The print used for the black and white version is fine, featuring only some minor dirt and sparkle. The colorized version is the same, apart from the beginning of the titles being slightly clipped, losing some of the music. The films on this disc are highly technical, inasmuch as they feature the stars in multiple roles. The main feature, Our Relations, is from 1936. Its two supporting shorts are Brats (1930) and Twice Two (1933). 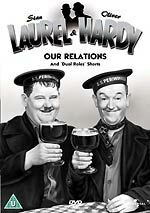 Our Relations tells the story of Stan and Ollie’s twin brothers, Bert and Alf, who are a couple of sailors on shore leave. The sailors meet a couple of girls in a beer garden when on leave. A fellow sailor (Finlayson) is “looking after” their pay for them. Stan and Ollie arrive with their wives. There follows a series of confused identity gags with the plot revolving around the location of a pearl ring entrusted for safe keeping with Bert and Alf by the captain of their ship. This culminates in a technical tour de force sequence at the Pirate Club, utilising great editing and optical effects such as split screen and back projection to achieve shots of interaction with the two sets of twins. 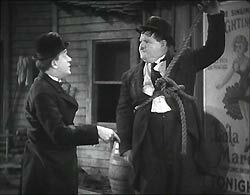 The end sequence set in some docks is hugely entertaining, as a bunch of gangsters, intent of getting the pearl ring, which they think Stan and Ollie have, give them half-moon “concrete boots” making them look like giant Subbuteo players! The film is great fun, although it is a bit laboured in places. The restored black and white print is fine with a standard amount of dirt, sparkle and the occasional feint scratch. The soundtrack is clear with some background hiss. This black and white version is a complete print, featuring footage that was cut in previous issues of the film. The colorized version is unfortunately the cut version. I noted seven edits in this version, with around six minutes of footage missing, although this figure is influences by other problems which I discuss later in this review. However, the print used for the colorization does seem to have undergone some cleanup, as it has noticeably less dirt and sparkle, and less hiss on the soundtrack, compared to the allegedly restored black and white print. Brats finds Stan and Ollie looking after their two sons, which they also play. The short follows the antics of the two children, which are increasingly exasperating for their fathers. The film is highly technical: as well as optical effects, it also makes use of very detailed reduced-scale sets for the two stars to act in as the children, which are replicated from the normal sized ones. It also features an animated mouse, and a sequence where the children overfill the bath, eventually flooding the children’s bedroom, when the bathroom door is opened by their parents. Beyond the technical interest of the short, I’ve always found it lacking in good gags, as they’re basically variations on the same oversized theme. The picture and sound quality of both the black and white and colour versions are rather poor with much dirt, sparkle and scratches. The version of Brats on this disc is a later reissue. The original 1930 version, with its original music score, art-deco style opening titles, and the long-missing introductory gag card, is on the bonus disc (which is only available in the complete box set). Having not seen this original version I cannot compare the two. 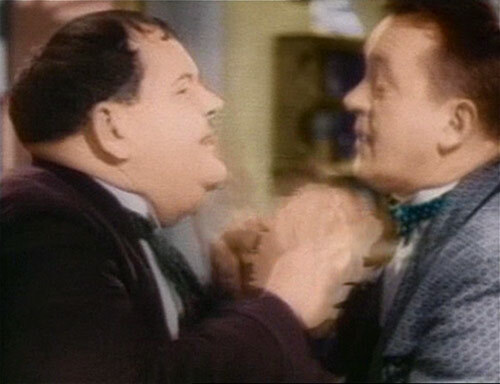 Stan and Ollie star as brothers-in-law in Twice Two, and also feature as their own sisters, to whom each other are married. The 1933 short follows the two couples as they celebrate their joint first wedding anniversaries, and the arguments that ensue between the two wives. This allows the duo to act as their sisters with much aplomb, with the additional enhancement of dubbed female voices - Stan’s sister has a high, squeaky voice and Ollies’s sister has a much deeper, fruity one – with characters to match. Overall it’s an enjoyable, fun short. The print used is in much better condition than the earlier Brats. There is a slight bit of damage to the end of one scene in the black and white version, where the sound quality dips, and there is plenty of dirt and scratches, which isn’t the case with the same footage in the colorized version. The black and white version does have restored opening titles, however. This is a fair short, with the highlight being Stan and Ollie trying to extricate the gangster from a locked trunk, with neither the gangster nor the duo unaware of the other's identity. The black and white source print is in reasonable condition, with some dirt and sparkle, but its soundtrack features some instances of strong hiss. The print used for the colorized version is identical. The first silent short of the disc is Do Detectives Think?, which features a similar plot to the previous short. Judge Foozle (Finlayson) convicts a murderer, “The Tipton Slasher”, who threatens vengeance upon his escape. When he does escape the Judge calls in the police. Ferdinand Finkleberry – “the second worst detective in the whole world” – (Laurel) and Sherlock Pinkham – “the worst” – (Hardy) are put on the case. There’s a good sequence involving a cemetary, which the boys have pass on the way to the Judge’s house. While walking by the cemetary wall Finkleberry does a quick switch of places with Pinkham, so that he is closest to the wall. Once they get to the Judge’s house, Pinkham is asked to prove how good a shot he is by copying William Tell, and shooting an apple from Finkleberry’s head. Pinkham misses and hits a vase. Finkleberry then moves his head to dislocate the apple, with Pinkham citing how good his shot was, and claiming the vase hit was an “echo”. This is all simple slapstick and now where near as sophisticated as what was to come, but enjoyable nonetheless. The quality of the restored print is okay, with lots of dirt, sparkle, scratches and the occasional jump. All what you’d expect from something of this age. In Habeas Corpus, which is also silent, a world-renowned Doctor, who’s going slightly loopy, employs the down-and-out duo to do a spot of grave robbing for him, to provide material for his experiments. The boys agree because they need the money. The Doctor is taken away by the police, and they follow the boys to the cemetary. Whilst simple again, it does evoke a wonderfully ghoulish, spooky atmosphere and also features the same switch gag by the cemetary wall, again performed by Laurel. The highlight of the short being all of the cemetary sequence. As with Habeas Corpus, the print is a little rough, but again that’s only to be expected. Angora Love is a prototype version of Laurel and Hardy’s later short Laughing Gravy, in which the pair try to hide a dog from their landlord, except that in this silent short it’s a goat they're trying to hide. Stan and Ollie are out eating doughnuts when a loose goat follows them in the vain hope of getting some for itself. They can’t shake it off so they have to take it back to their boarding house. Meanwhile, the creature's owner has called the police out to search for whoever has stolen his goat. This short shows the beginning of the more sophisticated plotting and humour, with more elaborate sequences, such as the scene where they’re trying to lose the goat, and the scene in the boarding house where they're trying to hide the goat from the ever-suspicious landlord. It’s a fun short and a step up from the previous two. In the next silent short, Bacon Grabbers, the pair are on the other side of the law when they join the Attachment Squad of a Sheriff’s Office. They are entrusted with the task of issuing a summons and recovering a radio from a man who hasn’t paid his instalments since 1921. Again this is much more sophisticated fare, on a par with Angora Love, but I didn’t find it as engaging as the previous short. However, it is notable for an appearance of a young Jean Harlow, in the early stages of her career. This print for this short is also on a par with Angora Love: very washed out, with lots of dirt and scratches. The Midnight Patrol is the other talkie on this disc and is presumably paired with Bacon Grabbers because it shows them working as “the law”. In this short they’re two patrol men on the night shift. They investigate a reported robbery, but have trouble getting to the scene of the crime, and even more trouble when they get there. This is a fun piece, with both acting incredibly dumb, even more than usual. It has some quite surreal touches of humour, notably the opening scene, where they are parked outside a store and told over the radio by headquarters that someone is stealing the spare wheel from the back of their car. There’s also a neat sequence where Stan goes into the store to use the telephone, thinking the man trying to break into the safe to rob it is really the owner who’s lost his keys. The black and white print is good, with only minimal dirt and sparkle. The colorized version seems to have used the same print. In the 1929 silent short Liberty, Stan and Ollie are two escaping convicts who are given clothes to change into, in their getaway car. They are dropped off, and, in their haste, they have put each other's trousers on. Stan is having to hold his trousers up and Ollie’s are far too tight. They wander about, trying to find somewhere to swap them, without seeming conspicuous. At one point they encounter James Finlayson as a store owner. The end up on a building site and fall into a lift, taking them to the top of the construction. Falling out of the lift, which promptly leaves them, they manoeuvre themselves around the open girders, high above street level, trying to swap trousers and find a way down. This is a fantastic short and has always been one of my favourites. The sequence with them tiptoeing around the girders features some great stunts and is reminiscent of Harold Lloyd’s famous 1923 film Safety Last!, where he climbs the front of department store building, clinging to a clock at one point. Liberty is the undoubted star of this disc for me. The print used is very good with minimal dirt and scratches, apart from a couple of shots which are quite damaged, most notably one atop the building in construction. The last short on this disc, 1929's Wrong Again, is also silent. The pair are stable boys at the Piping Rock Riding Academy, where they try to return a prize thoroughbred named Blue Boy, held at the stables by a millionaire whom it has been stolen from, when in reality it is a painting entitled The Blue Boy that has been stolen. This is another great short, with the highlight being the sequence when the boys have taken the horse into the millionaire's home, and are waiting to see him. The horse starts chasing them around and jumping onto a piano. For me, it isn't quite as good as Liberty, but it gets close. The print for this one is again quite battered and faded, but the quality of the work shines through. Just a word on the music and sounds effects which have been added to the restored silent prints. In most cases I found them to work well, being appropriate and effective – enhancing the on screen action and not detracting from it. I may have been a little a critical of some of the duo’s early silent shorts, but what they all do show is a lot of their trademark character traits and quirks. Ollie’s coy smiling while fiddling with his tie, Stan’s exaggerated tearless crying whilst twiddling his hair, and, most notably, their exaggerated head nod, were all evident in the language and techniques they developed during their silent films, and eventually became their trademarks as their popularity grew. All the disc follow the same format. Each one opens with the same introductory montage of clips set to the Laurel the Hardy theme, Marvin Hatley's famous Ku-Ku Song. Once you have seen it you can skip it by pressing the menu button on your remote, to save having to sit through it each time you want to view one of the films. All the menus are backed with a static, black and whiter graphic of an old fashioned cinema auditorium. The Main Menu has the Commence Your Dancin’ dance routine from Way Out West, playing (and looped) on the graphic's “cinema screen”, with the films contained on the disc listed below it. Also accessible from here is the Set-Up menu, which just allows you to to switch the English subtitles on or off. No other subtitles are offered. When you select a film from the list you are shown the auditorium image, overlaid with the duo's iconic bowler hats, with a quote either from Stan or Ollie, or the opening bars of their theme randomly played. This screen fades to black from the edges to a circle in the middle and then you are then taken to the selected film's menu screen. From here you can select the black and white version of the film or the colorized one (if there is one). Selecting one starts the film playing. Rather irritatingly, there isn’t a way to access the chapters from a menu, although you can do it on the fly whilst you are watching. The restored black and white prints used in the collection are presented in their original 4:3 format, and are generally all fine, apart from where the limited source material is damaged or of poor quality. Some of these prints seemed to have some cleaning, others don’t. The black and white prints occasionally exhibit cross-chroma interference, which is usually the result of PAL encoding. This is ingrained in the image, but could have been reduced if the material had been copied through a decent PAL decoder. Here's an example of cross-chroma interference, with a close-up showing the distinctive green and pink patterning. The colorized versions are generally much-maligned by the fans, and it's clear from these DVDs why this is the case: they are simply awful. The crudely-applied computer-generated colours are incredibly garish. They’re also poor NTSC conversions, with heavy interpolation and numerous compression artefacts. The colorized images don't look at all natural, the result of a combination of the poor quality of the colorization process, and the characteristically poor accuracy of ancient NTSC to PAL standards conversions. Flesh-tones, for example, are either an unpleasant orangey-brown, or a sickly greenish-pink. In this example, note the poor colour fidelity, and the double-image caused by the standards conversion from the NTSC masters. 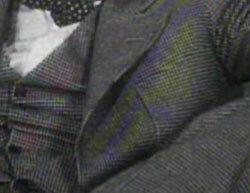 The numerous artefacts may be the result of the standards conversion, or excessive MPEG compression! The colorized versions often also present the films slightly zoomed-in, cropping off the edge off the picture, compared to the black and white versions. These screen-grabs demonstrate the differences in framing between the black and white and colorized presentations, and also the effectiveness - or otherwise - of the colorization process. The colorized versions were created in the early 90s, and are presumably taken from the same old analogue video masters used for their Vision Video release. Most exhibit flaws unique to analogue tape formats. The colorized versions were prepared using un-restored prints, so there are many discrepancies between them and the restored black and white prints, most notably between the two presentations of Our Relations. It's difficult to compare the running times of the black and white and colorized versions, because the colorized versions are PAL conversions from old NTSC masters. Some edits to the colorized versions are evident, however, most notably with Our Relations because it has so much missing footage. On the whole the colorized versions really are best avoided, and the collection would have probably been better without them. The films would have fitted on about as half as many discs, and the price of the collection could have been around half of what it is. Universal perhaps should have released separate black and white and colorized sets as the different versions are really catering for different markets. The sound is generally distinct, but all the films feature hiss of varying degrees. (This is, however, probably better than having them processed with excessive noise reduction). The audio is presented in Dolby Digital 1.0 mono format, at 192kbps. For technical reasons it was difficult to gain the exact average bitrate from these discs, but it seems to be around 5Mb/s, rarely rising above 6Mb/s. In summary, the box set is expensive but then it does contain a lot of films. I know a lot of Laurel and Hardy fans will be happy to pay the RRP (or whatever good online prices they can find) for the collection just to get all the films contained within it, and the individual volumes are priced better than the Vision Video releases of a few years ago. However, I do feel the discs would have been improved without the colorized versions and either a cheaper RRP or better special features on top of the content of the bonus disc. The individual volumes could’ve had some newly made features. For example, at least some of the pair’s well known or more popular films – Way Out West, Sons of the Desert, The Music Box, etc – could have had commentaries from film historians, or short featurettes about them. But, these three discs have given me a taster of what is a great collection of films, which should intrigue anyone who's interested in the early days of cinema, irrespective of whether or not they are a fan of Laurel and Hardy.